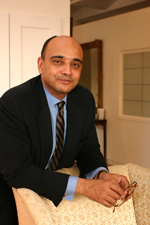 Kwame Anthony Appiah has been awarded Brandeis University’s first Joseph B. and Toby Gittler Prize. The $25,000 prize, the legacy of Professor Joseph B. Gittler, is the first and one of the largest academic prizes awarded to a U.S. or international scholar for outstanding and lasting contributions to racial, ethnic and/or religious relations. The prize also honors Gittler’s mother, Toby Gittler. Joseph B. Gittler was a sociologist by training who taught at Cardozo Law School and several of the nation’s leading universities, including Duke (where he earned his Ph.D.), George Mason, Iowa State, the University of Rochester, Yeshiva, Hiroshima in Japan and Ben-Gurion in Israel. Brandeis received many nominations for the prize, according to President Jehuda Reinharz, who chaired the faculty/staff award committee. Appiah is a Ghanaian philosopher, cultural theorist and novelist who has taught philosophy and African and African-American studies at the University of Ghana, Cambridge, Duke, Cornell, Yale, Harvard and Princeton universities. He is the author of numerous articles and several books. In 1992, he won the Herskovitz Prize for African Studies in English for the autobiographical “In My Father’s House,” which placed Appiah in the forefront of scholars dealing with contemporary African studies and identity. Among his later books are “Colour Conscious” (with Amy Guttman), “The Ethics of Identity” (2005) and “Cosmopolitanism: Ethics in a World of Strangers” (2006). As a lecturer in the Stanford Presidential Lectures in the Humanities and Arts, Appiah was called a “postmodern Socrates.” In general, his body of work questions and challenges most accepted theories about race, ethnicity, gender, sexuality, class, religion, nationhood and multiculturalism. In “Cosmopolitanism,” one sees the spirit of his work as he deals with the inherent conflict humans face in a global, technological society as “free” and independent, yet increasingly dependent on one another for survival. Appiah will be awarded the prize during a special awards ceremony and lecture Oct. 27 at Rapaporte Treasure Hall in Goldfarb Library on the Brandeis campus.